Do you have a skincare routine? In the current era, where pollution is a major concern, skin inflammation has become common among individuals. To keep the skin smooth and to protect the skin from inflammations, people often look for natural solutions. Although there are few effective skin care products, Aloe Vera is one of the best products that are more beneficial for the skin. There are plenty of benefits of applying Aloe Vera on the face at night. Proper care for body and skin is a crucial part as the skin is one of our body’s largest organ which acts as a barrier against infections. Good skin care generally involves cleansing and moisturizing. People generally do a cleansing to remove the dust particles and the dead skin cells that are overlapping our existing skin. Doing regular cleansing will definitely help your skin a lot and prevent skin problems like pimples or acne. Cleansing with aloe Vera reduce skin inflammation, blisters, and itchiness and keeps your skin soft and soothing. Let us see some of the benefits of applying Aloe Vera on the face at night. Aloe Vera is best known for its anti-bacterial and anti-fungal property. They are known for their profound benefits when used on a regular basis. Perhaps one of the most exciting benefits of using aloe vera on the face at night is its potential to prevent and reverse the sign of aging. Generally people use aloe vera as a natural moisturizer; however, aloe vera can be used as an excellent face mask to enhance your glowing and to achieve beautiful skin. When the mask is left over in face for whole night, the combination of the anti-microbial and moisturizing property blend well in the skin. It acts as a powerful method to calm down the skin besides making is smooth and clear. One should regularly use the Aloe Vera gel to improve the dry and rough texture of the skin. Are you worried about your pimples? Pimples or acne are no longer a problem after you have a wonderful remedy to get rid of your concern. Aloe Vera has antibacterial properties and has a good track in treating acne. 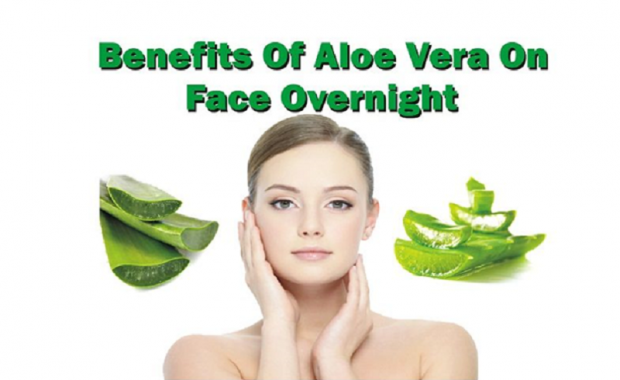 You can realize suitable benefits of using aloe vera on the face at night. They help fight against the acne producing bacteria and accelerates the process of healing. Aloe Vera is the perfect solution for the treatment of Acne, Pimple, scars, dark spots, pigmentation and for the removal of other white spots and skin irritations as well. Aloe vera is the ultimate anti-aging plant. The anti-bacterial property present in the plant prevents collagen breakdown which is the major factor causing wrinkles in the skin. There are many scientific types of research conducted with regard to anti-aging and evidence proved that aloe vera could heal skin and reverse aging. It works hard to combat free radicals. This apparently slows down the aging process. Aloe Vera can be used as an excellent moisturizer for oily skin. Shiny and greasy looking skin with big pores is typical signs of oily skin. The natural astringent property present in the substance has the potential to absorb excess oil for the skin surface and moisturizes the skin. Since it has the potential to remove the excess oil, it eventually removes the clogs from the pores thereby preventing acne. Aloe Vera is known for healing due to its anti-inflammatory property. Perhaps an effective ingredient that makes wonders in healing chronic skin problems like psoriasis, acne, and eczema. Plenty of medical surveys were conducted with regard to Aloe Vera and experts have found that it contains antioxidants, enzymes, and vitamins. A natural plant aloe vera does wonder when it comes to skin lightening. Experts suggest that aloe vera is packed with enzymes that work well for treating dark spots and brighten your skin. People using the aloe vera on a regular basis would definitely experience a clearer, brighter and lighter skin. Aloe Vera gel has shown various proven results to remove the dark spots from the skin and body. It is a good solution for the anti-aging treatment. Aloe vera can heal any skin with trauma or skin irritation. The natural astringent property present in aloe vera fight free radicals, repair damaged skin and reduce the scar due to acne or pimples. Medical studies prove that patients who had burn injuries recovered much faster when they used aloe vera gel. In addition, aroma treasures aloe vera gel for hair skin and body is well-known for the treatment of sun damaged skin. It is a well-known fact that aloe vera is one of nature’s best gift. Because of its anti-inflammation and anti-oxidant properties, it plays a major role in many of the beauty essentials. It can create wonders when it comes to skin infections on the superficial surface rather on the deeper side. So it is used in the effective treatment of acne and to exfoliate the skin to make it smoother. Because of its many benefits, it is used for centuries among people. If you haven’t experienced the real benefits of applying Aloe Vera on the face at night, it is not too late. Start using it and realize the immense benefits of such a wonderful product.